After deciding a life in accounting was not for him, Denis Waxman decided to set up his own company. His personnel recruiting business was launched in 1969, and after 17 years it was bought up by recruitment and services group Hays. 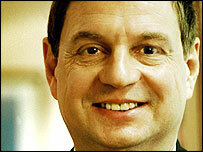 The 57-year-old joined Hays after the deal, as managing director of the recruitment business. After moving up the corporate ladder he was appointed chief executive of Hays in July 2004. It was a clapped out old banger that broke down in the middle of the Hangar Lane gyratory system. I can't stand cars and so I don't drive one now - I either take the tube or walk. A trainee chartered accountant, and I was paid £8 a week. I actually thought I was doing quite well for myself as I wasn't paying tax and national insurance. Little did I know that it wasn't just me, at that time in the late 1960s, nobody pay tax or national insurance on such a low wage. But I hated it, I thought the number-crunching was incredibly old fashioned and the job probably didn't suit my personality. But then I saw the light, or rather I saw it before the firm saw the light and told me to go. What was your first house? A flat in Stanmore, Middlesex, that I bought in 1970 for about £4,000. What's the best bit of business advice you've had? Always use your common sense, and I try to apply that kind of thinking whenever I can. Any time you work on that principle, you seem to come up with the right solution. If you ask obvious questions you don't go far wrong. I know this sounds quite corny but, in general, the people I find inspiring are not necessarily in business or famous. I think the people doing unrecognised jobs, and who do bloody well without being recognised for it, are truly inspiring; care and hospice workers in particular. That's the reason why I support Medecins Sans Frontieres, they don't get sufficient recognition for their commitment. If you could take some of the values of such people into the business world it would go far. It's easy to talk about people who get gongs but forget about the unsung heroes. What can the government do to boost business? The government should get some people in that have a degree of common sense and can strike a balance between protecting consumers, employees and the environment; and at the same time use common sense in dealing with such matters. What business story has grabbed your interest recently? I found the battle between Philip Green and Marks & Spencer earlier this year really interesting. It showed the real difference between somebody who took over a business using flair and common sense, and previous management at M&S who brought in business school people and management consultants. The latter were not down to earth and had no feel for what the public wants and M&S lost its way in that respect. However, with Stuart Rose now at M&S I think he's trying to change that and get the business back to what the customer really wants. What's the biggest challenge facing your business now? At the moment we're being presented with a lot of growth opportunities, and our biggest problem is choosing which to focus on. But really, that's a nice problem to have to tackle. Placing my first person in a job when I was founding the business. The very first placing was a trainee accountant, it took me about two weeks to find him the job. I got a payment of £38.50 for doing it, and it was a great start. Hays is a specialist recruitment and human resources company. The group has 306 offices in 16 countries across the globe, with a workforce of more than 4,600. Listed on the FTSE 100, Hays has a turnover in excess of £2bn and posted profits of £147m for the 2004 financial year.